“No one can live continually in sin and continue to say the Rosary: either they will give up sin or they will give up the Rosary” (Bishop Hugh Doyle). Based on the comments on facebook, it seemed like many of you may be interested in helping. I put the information together below to help you get started and also to just be a resource to anyone interested in the rosary. Thanks JG for your inspiration and God bless you in your mission to help others. 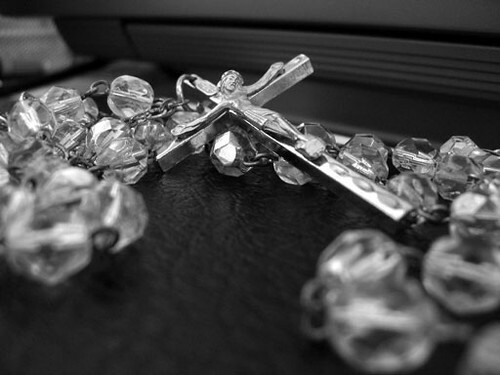 The History of the Rosary: The rosary probably began as a practice by the laity to imitate the monastic Divine Office (Breviary or Liturgy of the Hours), during the course of which the monks daily prayed the 150 Psalms. The laity, many of whom could not read, substituted 50, or even 150, Ave Marias(Hail Marys) for the Psalms. This prayer, at least the first half of it so directly biblically, seems to date from as early as the 2nd century, as ancient graffiti at Christian sites has suggested. Sometimes a cord with knots on it was used to keep an accurate count of the Aves. 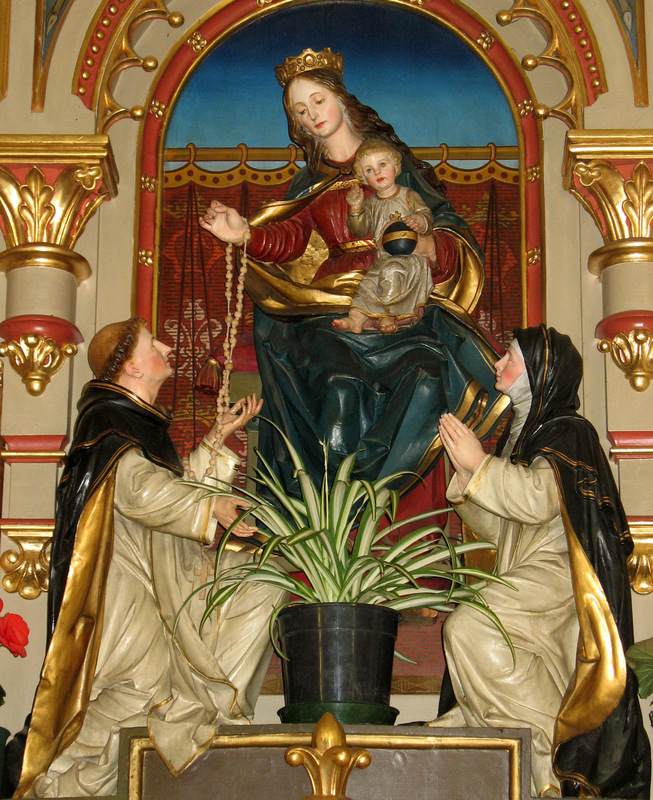 The first clear historical reference to the rosary, however, is from the life of St. Dominic (died in 1221), the founder of the Order of Preachers or Dominicans. He preached a form of the rosary in France at the time that the Albigensian heresy was devastating the Faith there. Tradition has it that the Blessed Mother herself asked for the practice as an antidote for heresy and sin. read more history at: EWTN- The Holy Rosary. The Catholic Company: This link gives you a plethora of books to choose from on the rosary. One I am currently reading and highly recommend is The Secret of The Rosary by St. Louis De Montfort. You may remember I used a quote from this book to help defend “wearing the rosary”. 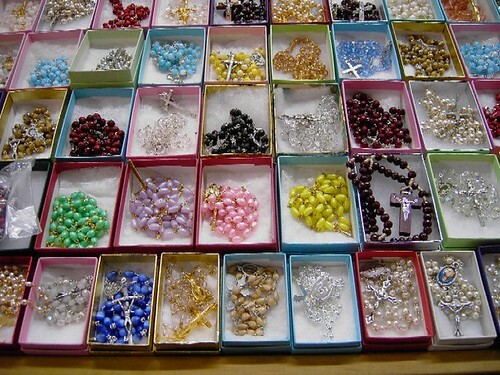 Rosary Making, Selling & Donating: I found a few good web sites for this category. I am sure there are a lot more out there so please let me know if you find a great one, and I will add it to the list. www.rosaryworkshop.com: This site is like walking into a little (eclectic) rosary boutique. They also feature Catholic antiques, jewelry and statues as well as a heaping helping of rosary history. Cool Find: Rosary Bead at the MET! Rosary beads, miniature altars, and other small devotional objects produced in Brabant in the early 16th century inspire awe by the detail and minuteness of their carving. Produced in relatively large numbers, these rosary beads were carved of many pieces of fine-grained boxwood which were then fitted together, presumably with the aid of a magnifying glass. On the outside of this bead is the crown of thorns among pierced Gothic arches and circles accompanied by biblical inscriptions. The upper interior depicts Adam and Eve and the tree of knowledge when closed; when opened, a triptych is formed, with depictions of, on the left, the Journey to Nazareth and the Nativity; in the center, the Journey and the Adoration of the Kings in the background; and, on the right, the Presentation and the Offering of Doves. In the lower half is the Crucifixion with ancillary scenes of the Agony in the Garden and Peter cutting off the ear of Malachus. via The Metropolitan Museum of Art – Rosary Bead. How To Pray The Rosary: Want to pray the rosary with the rest of the WORLD?? ?To pray the rosary online go to: Come,Pray the Rosary. Many of the sites I listed above have great instructions on how to pray the rosary. I found the illustration below at The Catholic Company. Don’t Forget About The Rosary App for your iPhone! I love using the app “Holy Rosary Audio” to say the rosary. For a newbie it is a Godsend…pun intended. Thanks for posting the youtube video. My spiritual director made me a lovely rosary for Christmas, complete with a St. Benedict medallion. One of my best friends makes beautiful rosaries as well. I didn’t realize how intricate it is to make a rosary until I saw the video. I will cherish mine even more knowing how much time and thought he put into it.